I hope you were all surprised by some of the authors/artists, and I suspect you will be because I've been watching the poll results as the guesses have come in, haha. But that's what's awesome, right? It's proof of just how talented this fandom is that we can still surprise each other. Authors and artists, feel free to flood our inbox with replies to comment reviews in all your naked username glory! 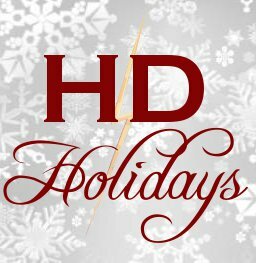 And, of course, you are free to pimp your fic far and wide and post wherever you like...the hdhols.com domain isn't going anywhere, but if you do want us to change the link on your uploaded art/story, just send us an email with the new link. We will be updating the individual posts with your usernames tonight. Thank you to each and every one of you for participating - especially those of you who threw your hat into the ring at our request to save someone from going without a gift. We'd also like to thank all of those who helped us out with proofreading/editing when we mods got a bit overwhelmed with the volume of 20k+ fics. SO MUCH LOVE FOR THIS! Thank you mods, for making this a wonderful fest for everyone! Thanks to all the participants for making some great work! And thank you to treacle_tartlet for the wonderful fic! Absolutely loved it! I KNEW IT!! And I'm thrilled!!! This hd_holidays was awesome. I love that the H/D fandom remains as strong and as talented as ever. Well, actually I think it's better than it's ever been. Kudos to all who participated! You are all amazing! Oh, awesome. This was a terrific fest! This was such a wonder fest! Now I have to go through the stories I liked and start stalking some people. Especially since I've heard rumblings for potential sequels! Oooh a few surprises :) Thank you for a lovely fest, mods, and thank you dragenphly for my lovely fic! Thank you so damn much, my darling! I had no clue! But you know, I was just thinking again today how much I loved Harry's sense of humour in it (amongst the many, many things I loved about it, which amount to being the entire thing). It makes perfect sense you wrote it! Love you to pieces! Thank you for your hard work and this wonderful fest. And thank you, ghot for the amazing artwork.